The melee mutants are the most common type of mutants. 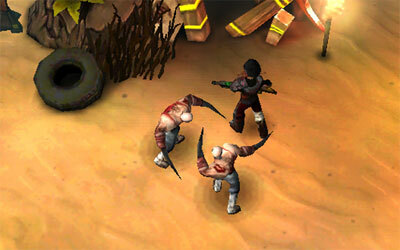 They run towards the player and attack with their blade-shaped claws. Melee mutants typically have low health and are rarely a threat unless they come together and surround the player. A melee mutant may drop silver only. In coop multiplayer, a melee mutant has a base score of 5 and the melee mutant champion has a score of 100. Melee mutants usually come in groups to attack players. Any kinds of weapon are good enough to deal with melee mutants since they have low health. But one may use a flamer in close range and an RPG in long range to take them out all at the same time. Sometimes they may come together with lurkers and attack the player. This is when it may get dangerous. If there are too many of them, simply run away from them to avoid further damage and pick them off one by one.